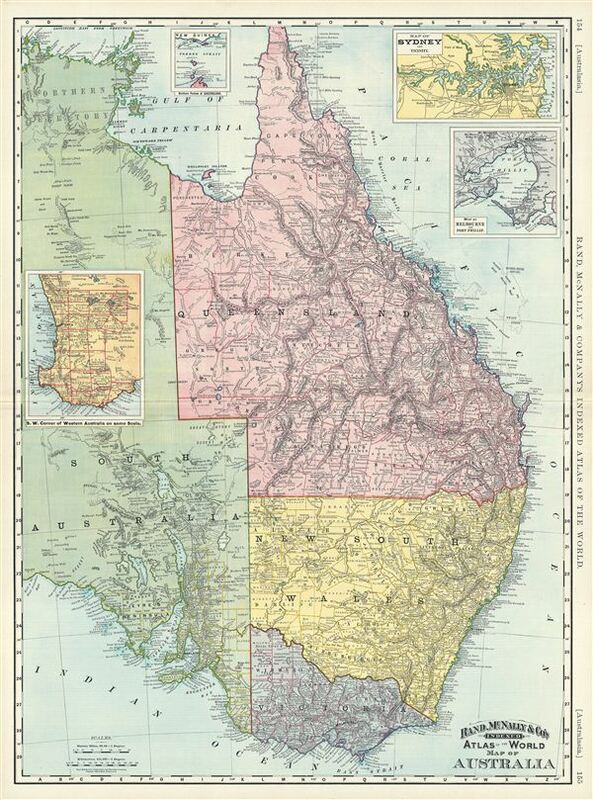 This is a beautiful example of Rand McNally and Company's 1892 map of eastern Australia. It covers the eastern half of the continent from Crocker Island to the Bass Strait. The provinces of Queensland, New South Wales, Victoria and part of the Northern Territory and South Australia are featured. Two insets in the top right quadrant detail Sydney and Melbourne while two additioanl insets along the top and left borders feature the northern portion of Queensland and the S.W. corner of Western Australia. Although the map is highly detailed along the coast lines and the interiors of Queensland, New South Wales and Victoria, large portions of the Northern Territory and South Australia are not only vaguely represented. Although at the time Australia was part of the British empire, the six colonies managed most of their own affairs through the practice of responsible government. Color coded according to provinces and regions, the map notes several towns, cities, rivers, mountains and various other topographical details with relief shown by hachure. This map was issued as plate nos. 154 and 155 in the 1895 issue of Rand McNally and Company's Indexed Atlas of the World - possibly the finest atlas Rand McNally ever issued. Rumsey 3565.041 (1897 edition). Philip (atlases) 1026 (1898 edition).